Furry Cat Designs - Karen Henderson - independent UK Stampin' Up! demonstrator: OnStage Local in Telford! A little later than planned (well actually a lot later than planned) with another entry! 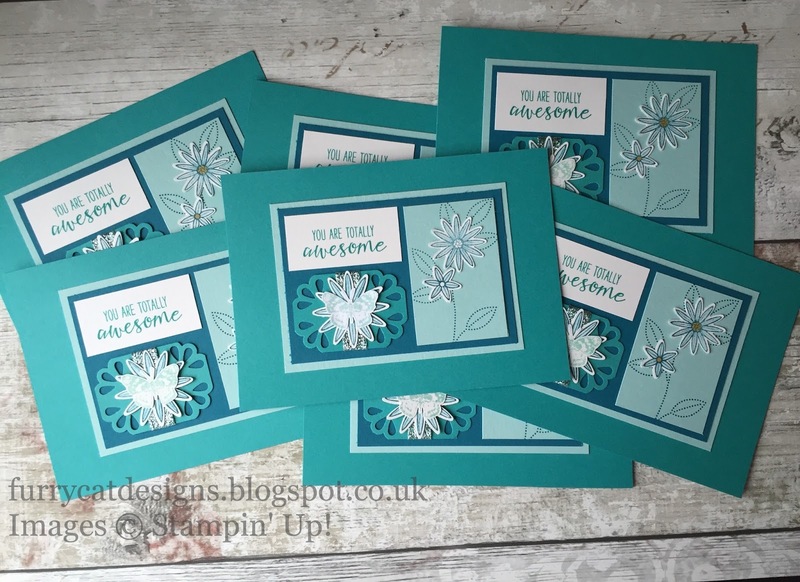 Yesterday, I spent the day in Telford at Stampin' Up! 's OnStage Local event along with 380 other excited demonstrators - I was not deterred by the early morning snowfall! There were displays for inspiration and presentations galore to whet our appetites for some gorgeous new products in the all new catalogue. In addition there was plenty of chatting and laughing, and of course there was swapping. Swapping is an integral part of any Stampin' Up! event. It is another fabulous way to share and exchange ideas and gain inspiration. I made 50 cards to swap and now I have lots of different projects ranging from cards to bookmarks to boxes and tags to give me more ways to be creative! These were the cards I made. I originally took inspiration from a card by Julie Davison that I saw on Pinterest. The layout is the same, but the colours and stamps aren't! My first card uses Bermuda Bay as it's base with Pool Party and Island Indigo layers. The stamping is done on Shimmery White card which is beautifully shimmery and a dream to colour on. 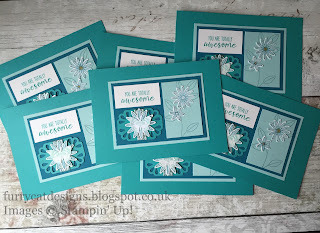 I've used the gorgeous Grateful Bunch stamps with the coordinating Blossom punch to create the flowers, butterfly and sentiment. The gorgeous Gold Wink of Stella Glitter brush finishes off the centre of the flowers. The butterfly sits on the largest punched out flower, and a hint of Pool Party Glitter ribbon wrapped around a small pannel whose corners have been rounded with the Curvy Corner Trio punch. I used my snips to fussy cut out the butterfly - no feelers were lost in the process! The colours for the second card are Night of Navy, Blushing Bride and Melon Mambo and this time there is a hint of Melon Mambo Stitched ribbon behind the butterfly. I hope you find something to inspire you to be creative today.